How true is “ZERO FARE”? « Read Aloud This Declaration Everyday to be Attract Wealth! AirAsia is the first airlines in Malaysia that using this Advertisement tactics to attract more Malaysians to Fly more frequently. It even have a tag line called “Now Everyone Can Fly” and bring massive revenue that enable the airlines to get listed in Bursa Malaysia in very short period of time. Yes, Malaysia Boleh! Advertisements on “ZERO FARE” are misleading and should NOT be allowed at the first place. The view is shared by Ngiam Foon , president of Malaysian Association of Tour and Travel Agents (Matta). Is there a FREE LUNCH? Who do not like free stuffs especially when come to Malaysian favorite i.e traveling. There is no such thing as “ZERO FARE”. In other word it’s NOT FREE at ALL. Customers still have to pay airport taxes, fuel surcharges and other fees which end up paying hundreds of ringgit. This charges add up is more than the ticket price as advertise like rm0.99. Countries like New Zealand, Australia and Europe had banned such misleading advertising practices. Certain European country have a new law to include taxes, necessary charges, surcharges and fees in the advertised offer. If we look at the present local advertisements, it only specify fuel surcharges, airport taxes and other fees are not included in the prices. These indications would usually be in very small print and we may need Magnifying Glass to read it properly. The seat for “ZERO FARE” are very limited and normally it’s only ONE WAY travel. It may mean travel out cost is cheap but travel back is on Normal flight rate. In order to protect consumer, the Government should called a review on advertising practices by airlines such as AirAsia and Malaysia Airlines to make them more transparent. All charges should be stated in the Advertisement for the consumer to make the wise decision. This entry was posted on Monday, July 28th, 2008 at 12:22 am	and is filed under Advertisement. You can follow any responses to this entry through the RSS 2.0 feed. Both comments and pings are currently closed. Of course there is no free lunch.. but I think it’s a common sense that zero fare is not free at all. As previously I bought the air ticket through MAS’s website, the airfare and tax are separated, so the airfare is really zero, just need to pay the tax. And the total price is much lower than normal price the airline charges. 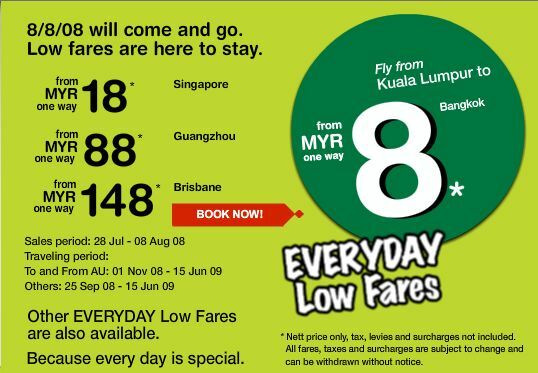 So i think it’s still worth to buy the tickets whenever low fare offer is announced.